OAKLAND, Calif. - Prosecutors have filed seven murder charges against the man accused of a fatal shooting rampage at a California Christian college. He also faces a special circumstance allegation of multiple murders that could make him eligible for the death penalty. Goh surrendered to authorities Monday, an hour after the attack at Oikos University that left seven dead and three others wounded. Police say in court documents that Goh admitted to bringing a .45-caliber handgun to Oikos and four magazines of ammunition. The documents say he acknowledged shooting several people before fleeing. Goh appeared briefly in court Wednesday afternoon. He was dressed in a red jail jumpsuit and was shackled at the waist. He was soft-spoken and said only "yes" when the judge asked him if he understood the charges. Goh did not enter a plea and was ordered to return to court April 30. He is being represented by the public defender's office. Meanwhile civic and religious leaders pleaded for an end to violence in the city. Several hundred friends, family and community members gathered for a multicultural prayer vigil Tuesday night to mourn the victims. "Only God knows the meaning of the suffering we endure," Dr. Woo Nam Soo, the university's vice president, said in Korean during the church service. "In this unbearable tragedy and suffering, only God can create something good out of it." Since his arrest, emerging details of Goh's life suggest a troubled man who has been struggling to deal with personal and family difficulties over the past decade. Romie John Delariman, an Oikos nursing instructor who knew the suspect and victims, said Goh got good grades, but he used to boast about violence and told a story about beating someone up who tried to mug him in San Francisco. "I don't know if you could call it mentally unstable, but sometimes he would brag that he was capable of hurting people," Delariman said in an interview with The Associated Press. Delariman said Goh was one of his most eager students, but he felt disrespected by his younger classmates. "He said he was too old to go school with all the young people, and he said all his classmates were mean to him," Delariman said. Ellen Cervellon, the nursing program director at Oikos, said she thinks she was Goh's intended target. She said the suspect dropped out of the nursing program last fall, but came back to ask her for a full refund on his tuition. Cervellon said Goh also told her that he felt the other students were picking on him. She says he became angry when she said the school could not refund all of his money. Police have released little background information about Goh, other than to say he had become a U.S. citizen. Though records list an Oakland address for Goh in 2004, he lived for most of the decade in Virginia, where a mentally ill student fatally shot 32 people at Virginia Tech before turning the gun on himself. Next-door neighbors in Gloucester County recalled him as being very quiet, but said he would speak if they spoke first. Goh kept to himself to the point that neighbor Thomas Lumpkin, 70, never learned Goh's name. "He was always well-dressed, nicely shaved, and his hair nicely cut," he said. Online records in the two Virginia localities show that, while Goh was there, he racked up tens of thousands of dollars in liens and judgments, including a $10,377 debt to SunTrust Bank in 2006. The Internal Revenue Service also issued tax liens against him in 2006 and 2009 totaling more than $23,000, though he apparently paid about $14,000 back in 2008, according to records. Capital One sued him for $985.96 on an unpaid credit card bill, plus court costs, according to Gloucester County Court records. The court issued a judgment against him on Dec. 9, 2011. His brother was an Army sergeant stationed in Germany who died in a March 2011 car crash while attending Special Forces selection training in Virginia, according to the military newspaper Stars and Stripes. The same year, Goh's mother died in South Korea, where she had moved, her former Oakland neighbors told the San Francisco Chronicle. It's unclear how Goh earned a living before he became a nursing student at the tiny private school of about 100 students. But in January, Goh found himself expelled. Oikos officials have not said publicly what led to his expulsion. According to the school's disciplinary policy, dismissal can come if a student threatens or harms someone or school property. "Because Oikos functions as a community of believers, students are to demonstrate a respectful attitude in all encounters," it states. The school kicked Goh out for unspecified behavioral problems and because he had "anger management" issues, according to Oakland Police Chief Howard Jordan. People at the school "disrespected him, laughed at him," Jordan said. "They made fun of his lack of English speaking skills. It made him feel isolated compared to the other students." 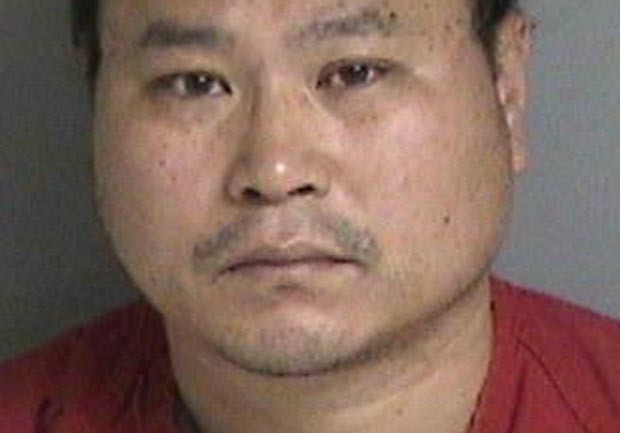 Around 10:30 a.m. Monday, after planning the attack for weeks, Goh arrived at the school in an industrial park near Oakland's airport, police said. Upon entering the building, Goh was intent on finding a female school administrator who wasn't there, Jordan said. Goh then accosted the receptionist, marching her to a classroom, he said. Goh "started ordering people to stand up, started yelling at them," the police chief said. "They started freaking out. He asked them to line up. Some did, some didn't, and that's when he began to shoot." By the time police arrived, five of the victims were already dead. Two died later in the day at the hospital. Those killed in the shooting have been identified as Katleen Ping, 24, of Oakland; Lydia Sim, 21, of Hayward; Bhutia Tshering, 38, of San Francisco; Sonam Choedon, 33, of El Cerrito; Judith Seymore, 53, of San Jose; Kim Eunhea, 23, of Union City; and Doris Chibuko, 40, of San Leandro. In another classroom, Dechen Yangzom hid with other nursing students, turned out the lights and locked the door just before the gunman arrived. At Oakland's Allen Temple Baptist Church on Tuesday night, Mayor Jean Quan joined pastors from the Bay Area's Korean Christian community in calling unity and peace in their often troubled city. "America has to look into its soul," Quan told the audience. "This is America where you can find a gun easier than you can find mental health services." Among those attending the service were friends of Ping, the slain receptionist who came to the U.S. from the Philippines in 2007 and leaves behind a 4-year-old son, according to her family. Bev Concepcion, a nursing instructor who often had lunch with Ping, was supposed to teach a class Monday morning, but the receptionist told her to teach the evening class instead. Concepcion said she's still not sure why, but that last-minute change may have saved her life. "She's a very sweet young lady, very hard working and family-oriented," Conception said after Tuesday's service. "It's so sad. It's very tragic, very painful. She's my very, very close friend and now she's gone."